Post Independent staffDr. 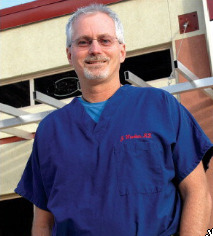 Jeff Wuerker has closed his urgent care facility in Glenwood Springs. GLENWOOD SPRINGS – An inconsistent volume of business and mounting financial problems led to the recent decision to close one alternative to the Glenwood Springs hospital emergency room for minor urgent care needs, after less than a year in business. “We were seeing 500 patients a month during the winter season, but that really went down in April after the ski season,” said Dr. Jeff Wuerker, a former Valley View Hospital emergency room doctor who had opened Colorado’s Urgent Care in West Glenwood last August. Wuerker opened Colorado’s Urgent Care in the Midland Center last summer with the idea of providing an alternative to the emergency room for less serious injuries and illnesses. Services included X-rays, basic treatment for lacerations, minor bone breaks and sprains, and treatment of allergic reactions, the flu, colds and other common ailments. The business had employed seven people at its height, Wuerker said. A chiropractor who shared the office, Errik Enewold, is looking to establish his practice elsewhere. He can still be reached in the meantime ,at 987-9222. Urgent care facilities are more prevalent in urban areas where there is a larger volume of walk-in traffic. Wuerker, 51, said he figured Glenwood Springs and the Roaring Fork Valley, with its large number of out-of-town visitors and a commuter work force, would support the new business. But he said competition from Glenwood Medical Associates didn’t help matters. Just before he opened, in addition to its regular physician services, GMA began operating an after-hours clinic from 5-8 p.m. for anyone with minor emergencies to see a doctor after regular clinic hours. Colorado’s Urgent Care’s model was different. It dealt exclusively with immediate emergency needs, offering care on a walk-in basis during regular business hours and into the evening on weekdays, as well as regular weekend hours. Wuerker said unexpected requirements from the Glenwood Springs Building Department, which he said cost him an extra $20,000 to $30,000 in increased building costs and about six weeks of income, delayed him from opening. “I was so far in the red to begin with, I never could get out of it,” he said, adding that Medicare requirements and other billing issues also factored into the decision.